AMARC builds heating cabinets that solve drum contained materials heating issues in a clean, safe, reliable and affordable way. Our heating cabinets are built in full respect of present international norms and are therefore CE marked. Heating elements made of carbon steel, stainless steel, AISI 316, 321, incoloy 800. Available with either standard or customized flanges. Length: up to 3 metres. Working voltage: 110 - 700 Volts. Power output: 0,5 - 1000 kW with temperature up to 800 °C. Installed directly inside the fluid conduits, or mounted on the flange for large diameter pipes, suitable for very high flow rates and low pressure drops. Available with smooth elements or with finned elements for increased heat exchange rate. Power output: 0,5 - 1000 kW with temperature up to 800°C. Fluid dynamic design to meet the customer’s requirements. 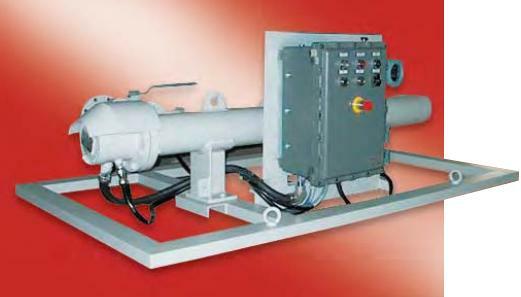 Resolution of high temperature and high pressure problems by means of heat exchanger banks. Standard low cost exchangers designed to our specifications. ower output: 0.5 - 3000 kW with temperature up to 800 °C. For all machines in which high precision thermal process control is essential, such as plastic extruders. up to 350 °C for aluminium, and up to 600 °C for bronze cast-in heaters. The sheathed heatings elements provide a more uniform surface temperature, better efficiency, longer life and greater safety than those of any other system. When cast in aluminium or bronze, in addition to their mechanical characteristics they acquire additional properties of excellent thermal exchange rates and uniformity of heating, making them ideal for the packaging machinery sector. Working temperature: up to 350 °C for aluminium, up to 600 °C for bronze cast-in heaters.